We went to Portobelo, on the Caribbean side, a few days ago and visited the UNESCO World Heritage Site that includes the old Spanish fortifications dating back to the early 1600s. Most people visit the town and then return to wherever they came from, but not us. When we finished poking around the town and fortification remnants, we noticed that the nicely paved road did not end in Portobelo, so we decided to take a drive to see where it went. Our guide-book was silent on this part of the world but the GPS seemed to know the road (from time to time). Undeterred by such details, we pressed on eventually coming to a sign that seemed to show we were entering Portobelo National Park. The road was a nicely paved two lane that took us through what looked mostly like cattle grazing areas. The roadway was mostly flat and straight but the scenery included beautiful high hills to our south. From time to time the road would wind up and over a hill or two. We passed through a couple of small villages, with their brightly painted houses and stores, before we arrived at a small town called Puerto Linda, right on the Caribbean. This was obviously a fishing town given the many fishing boats pulled up on the beach. There are a couple of small hotels here and a restaurant or two it seems. We were still not at the end of the road, so we elected to continue our drive along the Caribbean on the nicely paved road. Eventually we decided that maybe we shouldn’t go too much farther so we watched for a place where we could pull over and turn around. There was none! The road is built up here and has large-sized drainage ditches along each side. 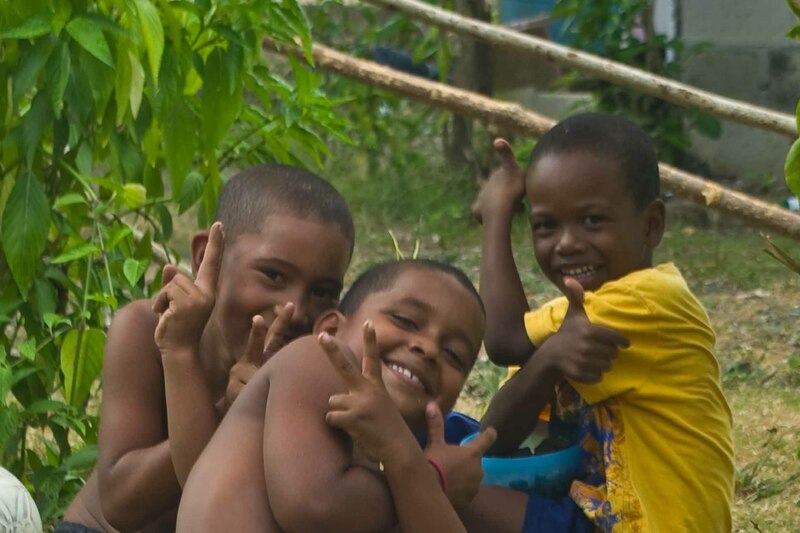 We continued for a while until we came to another village on the Caribbean. 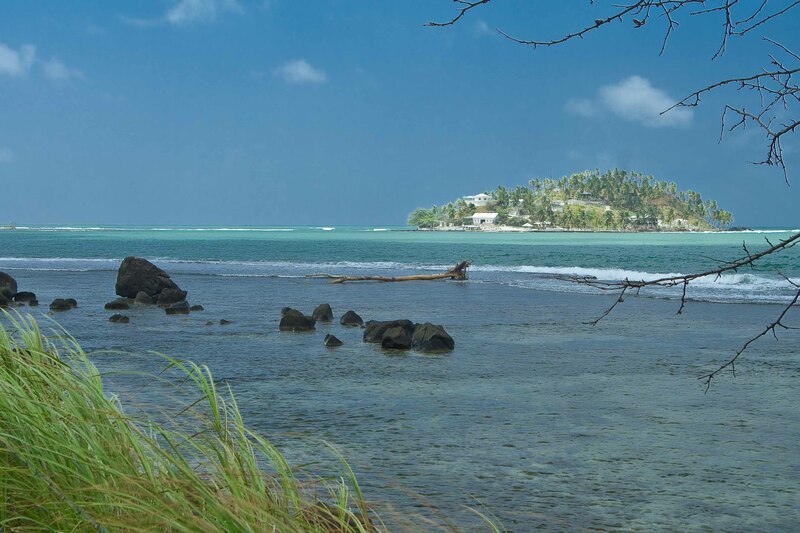 This one is called Isla Grande, for the island that lies just off shore. Here we found a parking lot and decided to look around. It was a short walk down a house lined paved street to the beach. Along the way, a group of young boys who were playing in one of the front yards, greeted us in concert with a loud “hola” (hello) that soon became “hola whitie”. They were encouraged by our laughter! The beach and coastline were beautiful so after the obligatory photo documentation, we got back on the road, heading back towards Portobelo. 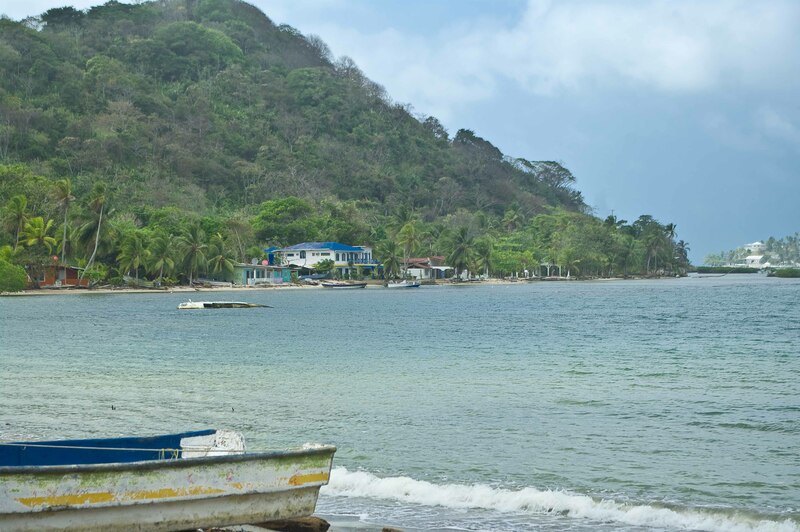 A bit of research on the Internet tells me that Portobelo National Park is located in Colon Province, and is about 1.5 hours from Panama City. The park, which is 20% marine area and 80% land is 34,846 hectares or 86 000 acres. 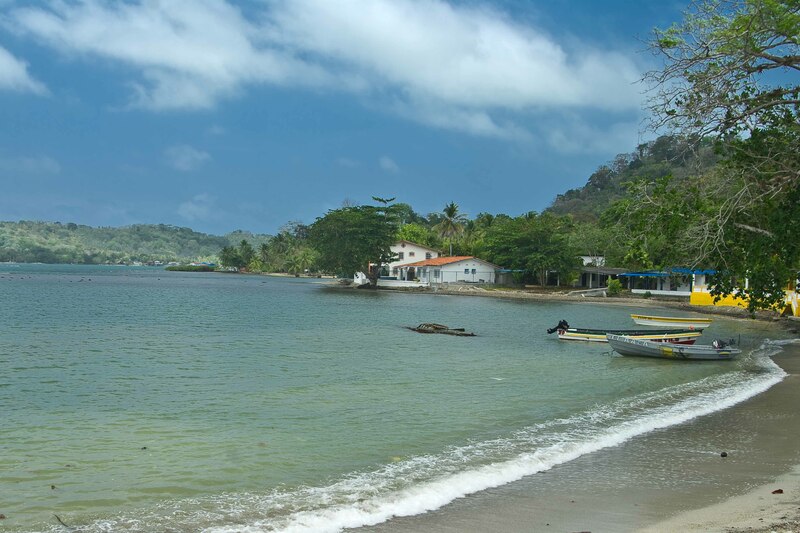 Portobelo National Park has 70 km of lovely beach front that is frequented by Panamanians and foreign divers. 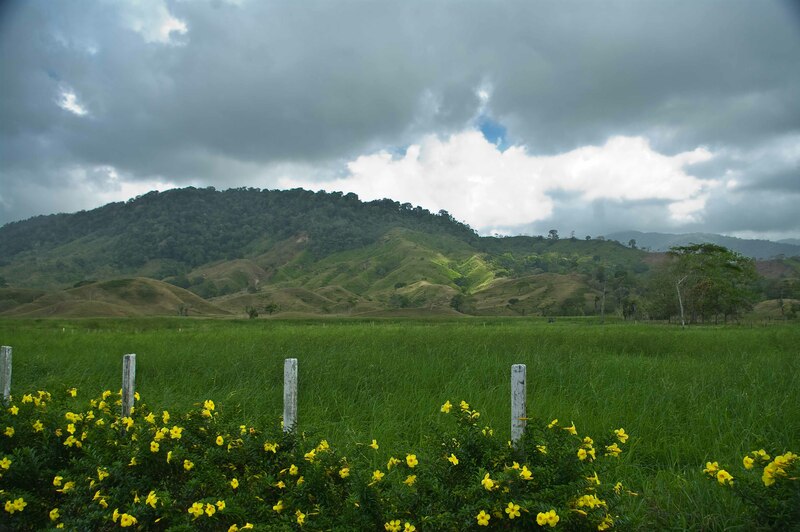 This area has a diverse cultural, historical and natural significance. Anyways, on the way back home we decided we needed to stop somewhere for a meal. Shortly after we had entered the park, from the other direction, we had passed a large newish looking building sporting the name Don Quijotes Pizzeria. We decided to try it. On arrival, we found the place empty of patrons but there were five or six staff keeping themselves busy. They must do a decent take out business as we spotted about 50 pizza boxes being built in an adjoining room. You pass through a wide arched entrance way into a good sized holding room. If you continue through the next arch, you are in the dining room which is open to the hills. The view is magnificent! 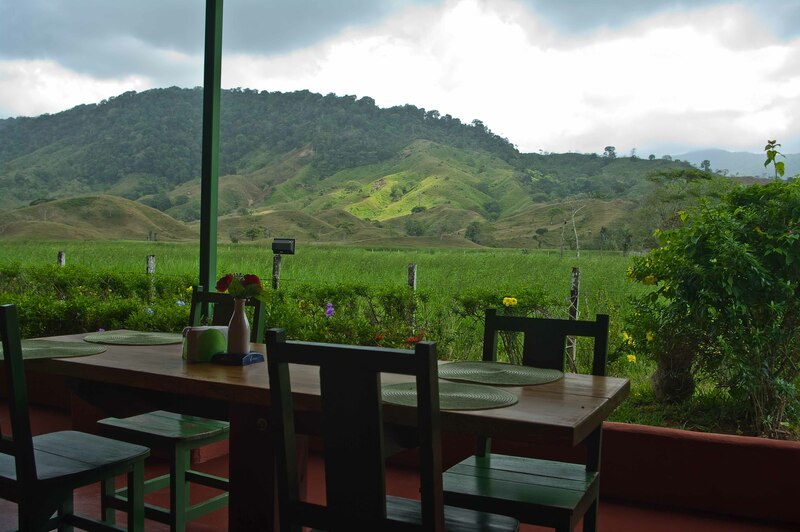 You look over level farm land to beautiful green hillsides. While we were there, it was kind of cloudy but the light was shining through onto parts of the hillside, making a striking vista. We ordered pizza, which is cooked in a wood fired oven. The service was great, the atmosphere was perfect and the views were stunning. Oh, and the food was excellent as well! Once again we experienced a private dining experience in a wonderful place. 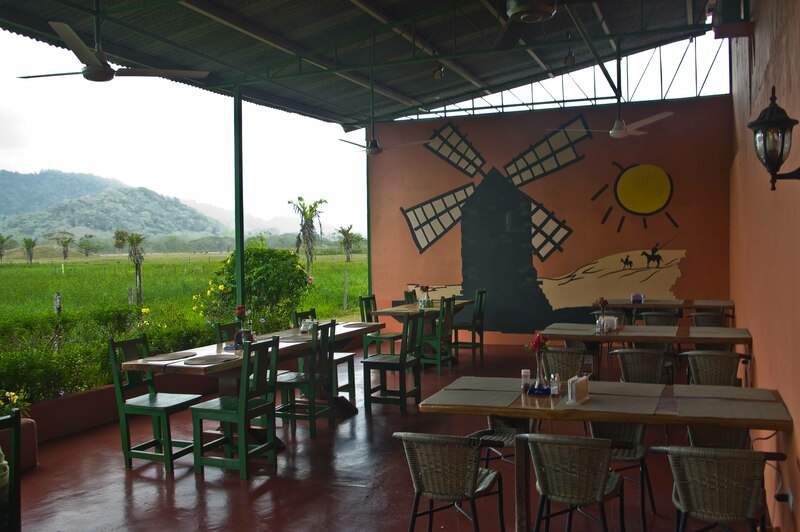 If you are ever in Portobelo, drive down the road a bit farther until you see Don Quijotes Pizzera on your right about 10 minutes after you enter the park. It’s definitely a place not to miss! Great pictures! 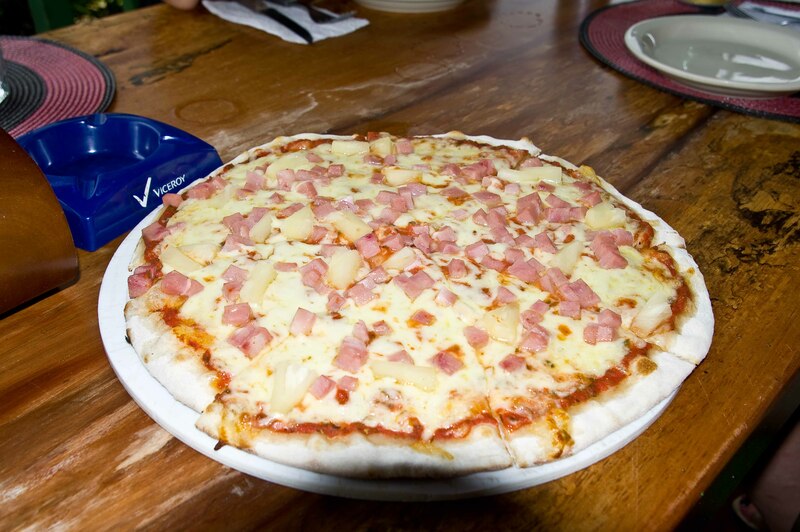 We’ll try out the pizza place next time we’re in Portobelo – probably in a couple of weeks! If you like pizza, this will be a winner!